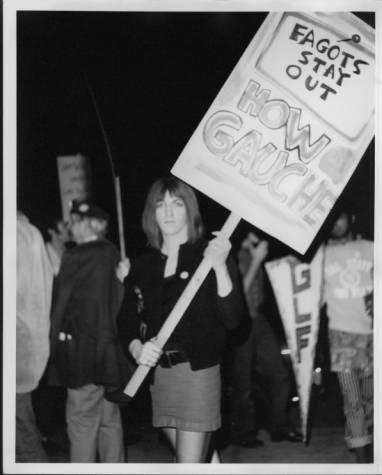 A crudely made, handwritten, misspelled sign played a remarkable role in the history of L.A.’s LGBT movement. The sign said “Fagots Stay Out,” and it made history at West Hollywood eatery and watering hole Barney’s Beanery. The sign was installed in the 1940s by founder John “Barney” Anthony, but it was the next owner of Barney’s who clashed with the area’s LGBT community over its presence. That owner was Irwin Held, who died on Monday at age 87. For years, Held resisted pressure to remove the sign. 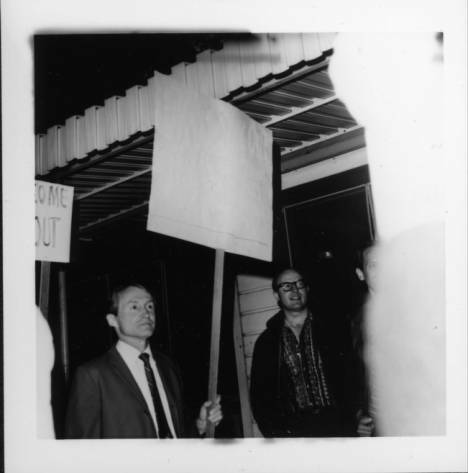 It began in the early 1970s with LGBT community leaders such as Rev. 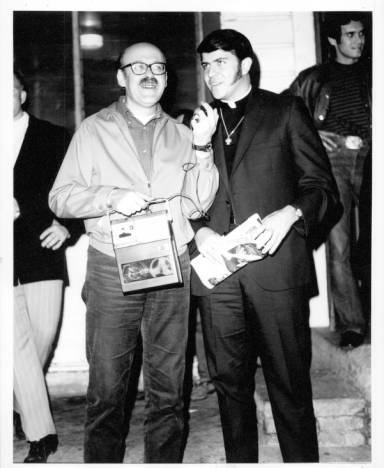 Troy Perry, founder of Metropolitan Community Church, and the late Morris Kight, a prominent activist. Perry said he was shocked when he first heard about the sign. He confronted Held, who said the sign “didn’t mean anything” and refused to take it down. Writer and researcher Mary Ann Cherry, who is working on a biography of Kight, said that Kight didn’t feel that strongly about the sign personally. 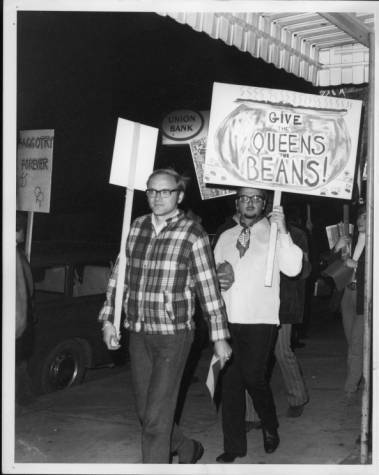 However, in the wake of the Stonewall uprising in New York, Kight wanted to mobilize the community in Los Angeles. 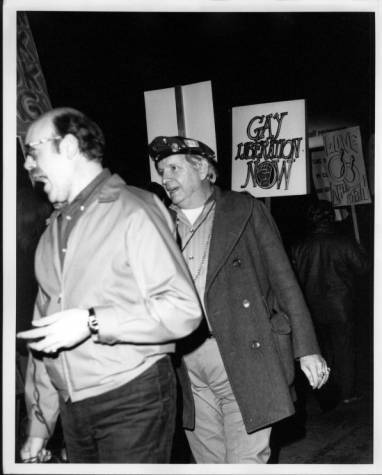 Fighting for the sign’s removal became a flashpoint for members of the Gay Liberation Front (GLF), of which Kight was a co-founder. “He knew it was more symbolic than anything else,” Cherry said. Activists put pressure on Held not only through organized protests but also through actions designed primarily to make them a nuisance to the business, Cherry said. “Sip-ins” involved settling into booths for hours while ordering nothing but coffee. In “change-ins,” people queued up in long lines just to ask the staff to make change. Tension escalated, and publicity followed. It “snowballed,” Cherry said, and it went on for months. The sign briefly came down in 1970 — but then it went back up along with several more signs. It wasn’t until early 1985 that it finally came down for good. With the newly incorporated city’s adoption of an antidiscrimination ordinance, Held faced hefty fees if he didn’t take the sign down. Why did Held hold out for so long? Especially considering that he told David Houston, the current co-owner of Barney’s, that he didn’t have a problem with gay people? Although Houston thinks the sign was offensive and that Held’s position was wrong, his perception of Held is not of a homophobe but rather “an old-school kind of business guy” who resented feeling like he was being told what to do. The removal of the sign was a time of the changing times in West Hollywood — but many LGBT people continued to steer clear. “I moved to town in 1987, and it was understood that if you were a gay person you didn’t go there — and then that changed,” said Councilmember Jeff Prang, who after hearing Barney’s had new owners sought out a meeting with Houston. Rev. Troy Perry, too, would have continued to “stay out,” but to his surprise the new owners extended a public apology. In 2005, Perry went to Barney’s to accept the apology in person. He stayed to eat after, and he’s been back a few times. Forty years after the notorious sign ignited early LGBT activists, Perry sees Barney’s as a “great old-fashioned place” to stop for a bowl of chili. That’s an awesome insider story, Tyler St. Mark. Thank you for standing up for rights and for your other goods works for the community. 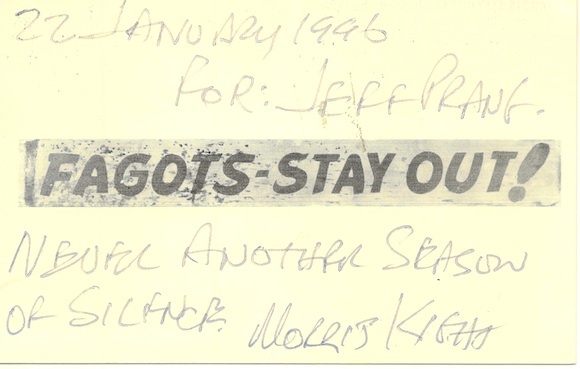 In 1984, one of the first acts of the brand new city of West Hollywood was to remove that “Fagots Stay Out” sign from over the bar at Barney’s Beanery. At that time, I was a media specialist with the pr/ad firm, The Commications Works, hired to handle the city’s press until a permanent media department could be established. I was present when Mayor Terrigno, the city’s new attorney, and the media arrived at BB to order the removal of said sign. The bar’s owner cryptically informed Her Honor that, if she wanted the sign down, she would have to do it herself. To that end, Mayor Terrigno attempted to remove the first of two screws holding the sign to the back cupboard. Unfortunately, nobody thought to bring a screwdriver. While the media watched, Ms. Terrigno fumbled for a few minutes in front of the waiting press until it was suggested that she go outside to answer questions until the sign could be removed and brought out to her for photos. Everyone rushed outside and the task of removing the sign went to me. While I was trying to unscrew the sign with a dull old screwdriver someone found, I heard a voice behind me say, “What the hell ya think ya doing? !” I looked around to see several rednecks glaring at me. Everyone else was outside and I’m standing there in a suit and tie all alone with nothing to defend myself against these two hostiles. In a panic, I reached up and jerked the entire wooden sign down, pulling the screws through the holes and leaving gaps where the screws had been. I held the sign like a club as the two rednecks backed away and I took the sign out to the Mayor. The simple fact; it was me who actually removed the sign from BB–out of fear and in self-defense. Stories about Barney’s anti-gay sign are part of Weho urban mythology so thanks for the details and history. As for Irwin Held, may he be greeted at the gates by Liberace and sentenced to an eternity of listening to show tunes! great work on this article…..never have i found one source with so many details about the sign at barney’s…..thanks!! If Don Slater held a sign at the protest, it was NOT one saying to take the sign down, but to keep it up- as the owner of a private establishment/business had and has the right to be a bigot. The answer was and is to not do business with that person. I believe that today Don would say the sign should still be up and a homosexual should own and run the business. That is true victory. It is strange that even the “educational” effort did not get the sign down, it took a law. That is not what most of us think works-but then it takes both to really change people. Irwin! 200 yrs ago he 86’d me out of Barney’s for passing out there. Gone are the days. Fond memories. I deserved it.